beginning to char, 3 to 5 minutes for the zucchini and squash, 6 to 8 minutes for the peppers and eggplant. Spread out to cool slightly on a large baking sheet. Roughly chop hot veggies into bite-size pieces. 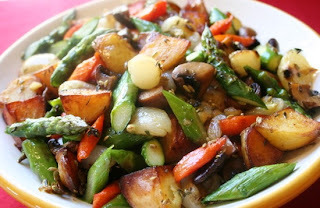 In a big bowl toss vegetables with mixture of herbs, wine, vinegar, salt and pepper on a large platter.